Tony’s is described with terms like “legendary,” “venerated” and “landmark,” and the ratings for service are very high. It seemed like a good place to have our traditional “End-of-Nationals” meal. The host informed Steve that he needed a jacket for the dining room and gave him a loaner blazer. The website says business causal, but the host explained it is more formal on Saturday nights. I would be weirded out by wearing a loaner jacket, but Steve seemed to take it all in stride. Luckily, I was in a dress and heels. We started with seared sea scallops with a black truffle sauce. This appetizer made it on to St. Louis Magazine’s “50 best dishes” and the accolade was well deserved. I thought my scallop was excellent, but for $13, I’m not sure if $6.50 a scallop is reasonable. The homemade penne with mushrooms and asparagus ($11) was also delicious. The bread basket also had a nice variety of focaccia, crostini, olive bread and ciabatta. Steve had the veal rib chop with eggplant. 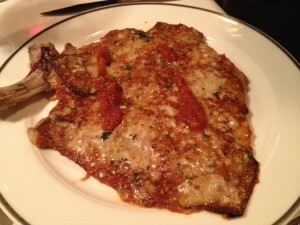 It came as a giant, flat, pounded piece of veal with a eggplant parm layer atop it. We didn’t feel it was terribly flavorful nor interesting. If I was paying $17 at Carlo’s Cucina Italiana in Brighton, I would have been content, but at $38, I was expecting a lot more finesse. His potatoes were also under cooked. 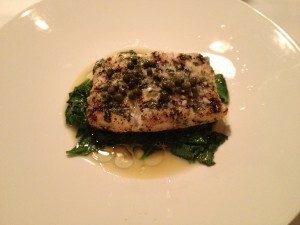 My grilled filet of halibut ($33) was fine – I liked the lemon caper sauce. Steve thought my fish was underdone, but I enjoyed it. The service was excellent; all of our food was cooked in the kitchen, but finished tableside on kerosene burners. I didn’t really see the point of this. It’s one thing when you are making a cherries jubilee or something that requires flaming, but mostly I just worried that my food was getting overcooked. We finished our game late on Sunday and the ground was covered in 4”+ of snow. I was grateful just to find somewhere open for dinner. Lucas Park Grille far exceeded my expectations. The space is really nice, divided in to different areas. We sat near a roaring fireplace. 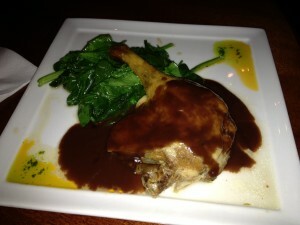 We had the duck leg confit to share. It came with a nice raspberry sauce and arugula. 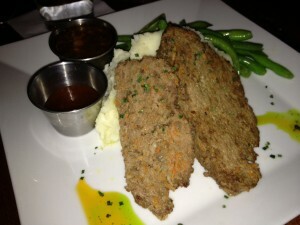 My meatloaf, garlic mashed potatoes and green beans ($15) hit the bull’s-eye in my comfort food spot. Steve polished off his smoked pepper grilled pork chop ($20). The prices were reasonable and our server was great. She didn’t seem to mind waiting for us to close the place up.